The Girl with a Pearl Earring is a painting by Johannes Vermeer, which exactly like Leonardo da Vinci’s Mona Lisa is one of the world’s most famous paintings, and also one of the most reproduced. It’s a painting which evokes beauty and mystery, a face which continues to fascinate everyone who admires it in person, or has discovered it through movies and books, even after more than three centuries. The painting is also known as “Head of a Girl with a Turban”, and in this post I’ll tell you 5 things to know to really know it. 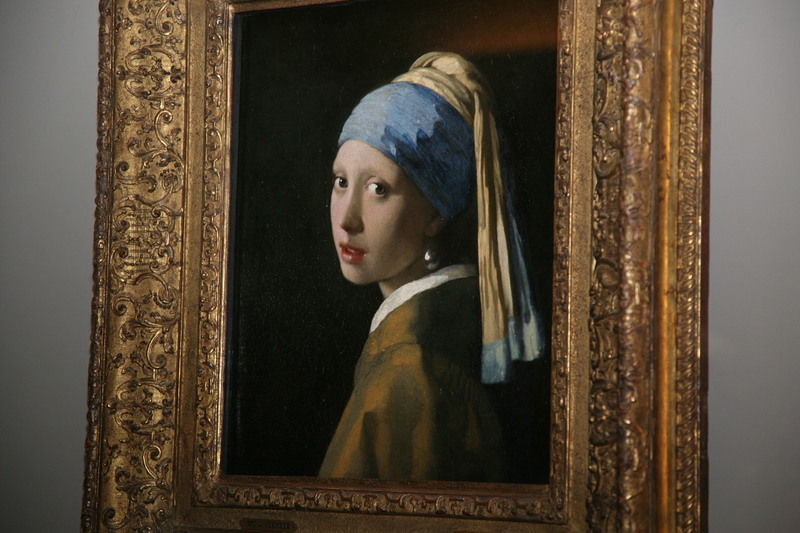 The Girl with a Pearl Earring is on display at the Mauritshuis museum (or Royal Picture Gallery) in The Hague, one of best art museum in Europe. Vermeer’s painting entered the Dutch collection in 1903, thanks to a bequest from the collector Arnoldus des Tombe, who had purchased it in 1881. READ ALSO: What to see in Amsterdam, the 5 most important museums. Actually, nobody knows the true identity of the Girl with a Pearl Earring. In 1665, when the painting was painted, Vermeer painted 3 similar works called “Tronies”, that is 3 conventional portraits of people, a genre in vogue in the 17th– century Dutch painting. The Girl with a Pearl Earring was one of those 3 portraits, and the most beautiful. Vermeer didn’t paint a full-length figure, but from the waist up, and maybe it’s this feature that makes this painting so intense and mysterious. Besides, Vermeer’s ability allows the look to isolate a series of details and at the same time to realize that the painting is a snapshot: in other words, the painter captured on the canvas the precise moment in which the girl looks at the viewer. 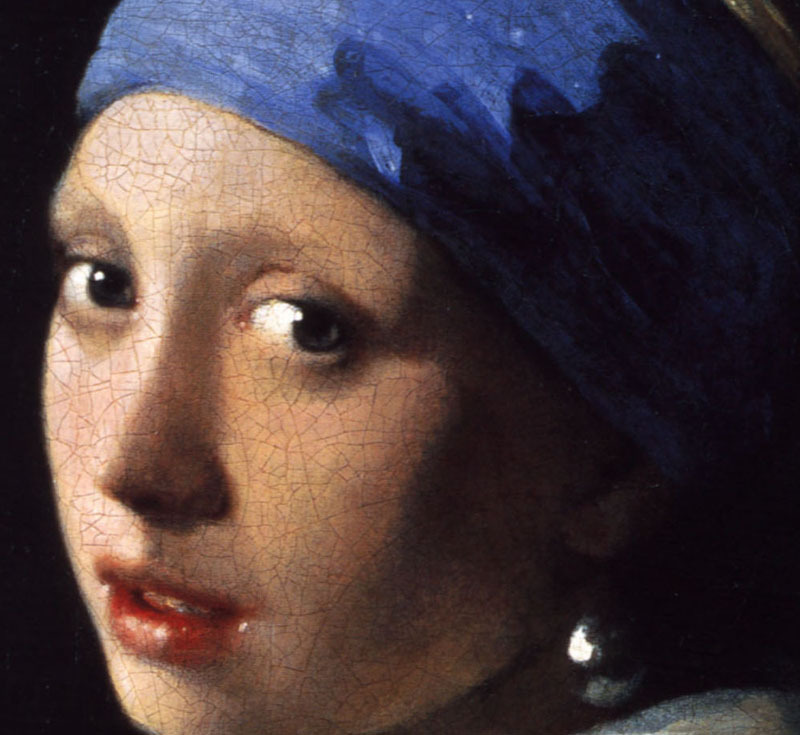 The Girl with a Pearl Earring is one of Vermeer’s most beautiful masterpieces. The blue turban was painted in very expensive ultramarine, a colour obtained by pulping lapis lazuli. The title of the painting , by which is universally known, derives from the earring worn by the girl, whose pearl reflects the light coming from the left, but which is probably too large to be real, so it must be a blown glass pearl. In 1999 Tracy Chevalier wrote a novel entitled “Girl with a Pearl Earring”. In the novel the writer imagines the true identity of the girl portrayed by Vermeer: a 16-year-old maid working in the house of the painter who would become the subject of his masterpiece. The novel inspired a 2003 movie directed by Peter Webber, starring Scarlett Johansson, which has contributed to make the painting housed at the Mauritshuis museum a worldwide success. Il modo in cui la giovane donna, con la bocca appena socchiusa, porge il suo sguardo volgendo il capo suscita in noi quasi la sensazione di aver disturbato i suoi sogni. Il quadro invita alla congettura e questo aspetto ha sicuramente contribuito alla straordinaria popolarità del più famoso dipinto di Vermeer.